Whether you’re a knife enthusiast or looking for a hobby that will make you money, knife collecting can be a rewarding activity. Knife collections fetch thousands of dollars on sites like Ebay, Craigslist and Knife Auction, but if you don’t know where to begin, things can quickly get complicated. Here are a few tips for beginners who plan on venturing into the fascinating world of knife collections. While many knife admirers may have the urge to buy and collect all types of knives, it’s important, at least to begin with, to focus on one type. 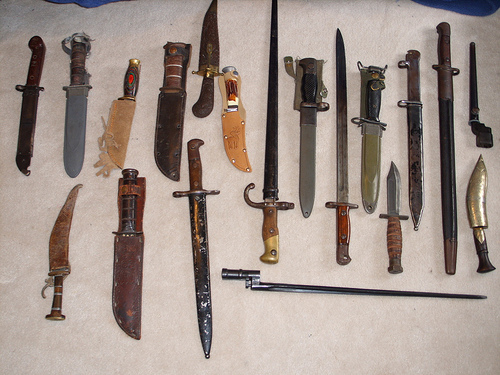 Fortunately, there is a large range of knife types you can pick from, including pocket knives, daggers, swords, Bowie knives and antiques. Selecting just one variety gives you a clear focus, so you are not overwhelmed by the numerous choices. This might seem like an ancillary point, but it’s extremely important to consider before embarking on a collection. Knife prices range anywhere from a couple dollars to well over a thousand bucks. If you’re not absolutely serious or sure about collecting knives, set a smaller budget and work your way up. Once you’ve selected the type and picked a budget, the next step is to begin purchasing knives. People take different approaches on how to buy knives. Some get one at a time while others buy sets. Knowing the prices and models of the type of knife you’re planning on collecting will prevent you from overpaying and give you authority on the subject. The Official Price Guide to Collector Knives is a great place to get started. 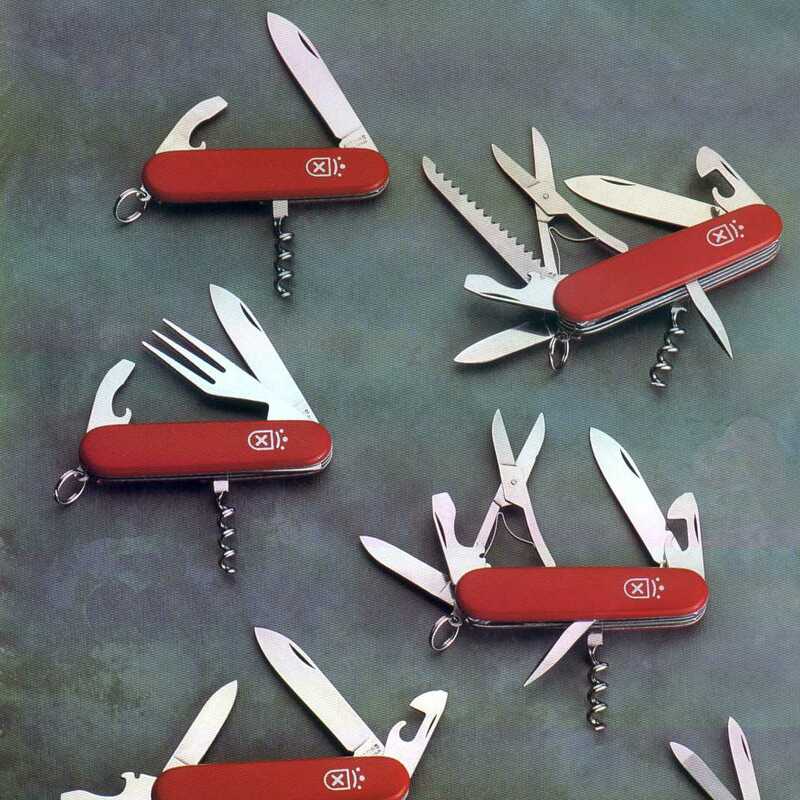 There is no wrong place to look for knives, but looking at a range of sources ensures that you have more options. Look up local antique shops, visit the Knife Auction site, attend a knife show or join knife collection forums. Doing these things will help point you to reputable knife dealers who may have hidden gems. The California Court of Appeals recently determined that a butter knife, even when used to try to cut someone’s throat, is not a deadly weapon. This fascinating case began at a Los Angeles high school when three students attacked another student, simply identified as Deon, on the school’s campus. As two students held Deon down, the main attacker, Brandon, pulled out a knife and tried to cut Deon’s throat. But, when the knife’s handle fell off, the students fled the scene. Because the knife did not cause significant damage, the California Court of Appeals ruled that the butter knife was not a deadly weapon. This downgraded the attack to a misdemeanor, overturning a previous ruling that charged the defendant with a felony. The actual knife used was a little more than three inches long, had a rounded edge and slight serrations. Maine State Representative Sheryl Briggs is mounting a campaign to legalize switchblade knives for individuals with one arm. The proposal is similar to a federal law that exempts those with one arm from the prohibition of switch blades of 3 inches or less. 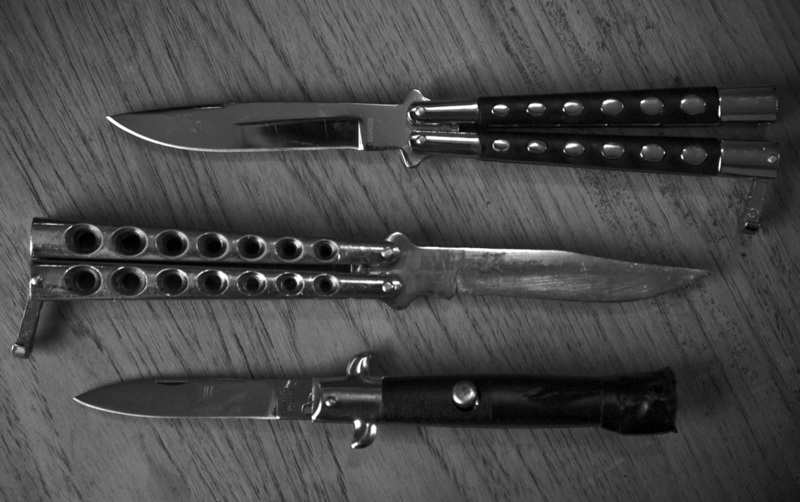 The reasoning behind the push, quite simple: it’s hard to pry open a normal knife with only one arm. According to Briggs, one-armed lawyer Paul Dumas Jr. asked her to introduce the bill. It gets tough to open up a knife one-handed. I use my teeth sometimes, and that isn’t very safe, Dumas said. A House committee plans a hearing on the measure next week. The effort is one of many to decriminalize certain types of knife possession. Last month, I blogged about the recent efforts of the knife advocacy group Knife Rights Inc. to ease knife restrictions. In May, the group led the way in successfully repealing a New Hampshire law against switchblade possession. 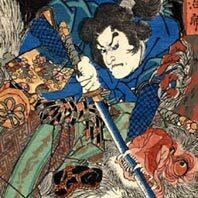 The samurai sword, also known as the katana, has a rich history dating back from ancient Japan. The sword, which typically exceeds 23 inches in length, is known for its curved single-edge blade and long grip. It gained popularity among waring clans in 12th century Japan and has traditionally been a sword associated with an elite group of Japanese swordsman. NOVA recently put together a documentary entitled “Secrets of the Samurai Sword,” which breaks down the history of the sword, its construction and the warriors who used it. Here are a few of the highlights. The samurai quickly rose to the status of elite swordsman and as early as the 12th century had established themselves as the knights of Japan. Between the 12th century and the 16th century, they were active in a number of armed clashes, insurrections and battles over control of Japan. According to the documentary, the samurai were treated with great reverence and up until the 17th century could could legally kill any common person who did not show them sufficient respect. However, along with this respect came a set of ethics that could prove fatal to the samurai himself. They lived by their own moral code, called Bushido, which deemed a death by enemy to be dishonorable; for this reason, the Samurai would often commit suicide if death on the battlefield appeared unavoidable. The documentary also details the painstaking process of constructing a samurai sword. During the construction of the sword, which can last up to 3 months, over 15 men, from steel forgers to sword polishers, will work on it. Eventually, it returns back to the original swordsmith, who will have the final say on whether or not it is worthy of a samurai warrior. An article published by ABC News today reported that a Japanese sushi federation has created a certification program for aspiring sushi chefs. 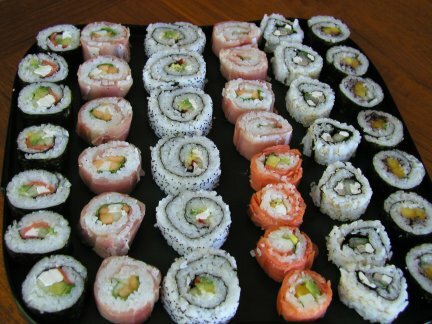 “We just want to make sure foreign chefs understand the basics of sushi making: how to cut, clean and prepare raw fish,” said Masayoshi Kazato, an experienced chef who was one of the creators of the test. Not surprisingly, one of the criteria for receiving a certificate was knowing what type of sushi knife to use. Kazato said he noticed a difference in the knives being used to cut the fish by inexperienced chefs, which is a concern because dull knives often don’t cut smoothly and expose the fish to more air, accelerating deterioration and increasing the potential for bacteria to attach to the fish. We posted about the myth that dull knives are safer than sharp knives, along with other knife myths, a few months ago. Though a dull knife will have less of an impact if it grazes your flesh, it’s not safer, because it forces you to use extra pressure when cutting. It seems that most knife owners have been disabused of this myth, but we recently ran into a discussion forum at Mythbusters.com, where some participants were still suggesting that dull knives were safer. When preparing sushi, which is extremely delicate, the need for a sharp knife is not just for safety but to ensure quality as well. A dull blade will crush a maki, which is an all-encompassing term for sushi rolls with rice, toasted seaweed, nor or other fillings. It’s also important to remember to never use a electric sharpener to sharpen a sushi knife, but to always use a sharpening stone, especially if you aspire to join the ranks of certified sushi chefs some day. A few weeks ago, we blogged about the efforts of the group Knife Rights to repeal many of the laws regulating knives. A recent column by Greg Bean of the New Jersey publication The Examiner gave a prime example of the confusion surrounding knife laws in many states. Bean tells the tale of a young man who was arrested at a random DUI checkpoint for possessing a pocket knife. The man, who declined to be named for the article, wasn’t drinking and had spent the day on a remodeling project. According to Bean, the man faced a felony charge but eventually plead guilty to disorderly conduct and paid a $800 fine. Bean said that the man told him that he asked the judge to provide clarification of what law he’d violated, but received none. Bean tried to find the answer himself, but after asking a number of cops, judges and prosecutors, he failed to get a comprehensive answer. They confirmed what I suspected, and here’s what they said: Because the state statutes are so vague, law enforcement can do just about whatever it wants, from taking the common-sense approach and letting the poor sod go, to incarceration, to astronomical fines, no matter how arbitrary and capricious their actions appear. Bean’s editorial isn’t the only one expressing disgust at poorly-defined knife laws. Knife advocates across the country are speaking up in greater numbers about what they perceive to be vague and poorly-intentioned state and local knife laws. Bean feels that the laws make criminals of those who are simply carrying knives for functional reasons. There are a bunch of camp knives out there, often making it daunting to make a purchase. The video below, in which an old-time knife connoisseur is explaining the differences in camping knives to a knife newcomer, is a great example of the diversity of the camping knife market. The man has stretched approximately a dozen blades across the backside of a canoe and proceeds to explain the values of each one. He talks about the convenience of folding or pocket knives. He calls the fixed blade knife a “failsafe” because of its lack of moving parts. He describes the importance of hunting or survival knives, which can be used to gut animals, cut wood and erect shelter. And, lastly, he shows off a few boning knives and a couple of fillet knives. So you’re interested in knife throwing? Well, before you go pro, the first thing you need to do is learn how to hold a knife. There are two primary grips used by knife throwers, both of which we’ll explain below. The hammer grip is the easiest method of holding a throwing knife and the appropriate method for beginners. As you might expect, in the hammer grip hold the knife just like you would hold a hammer. Remember to keep your wrist stiff and only grasp the knife by the handle, in order to avoid cutting yourself. The hammer grip is primarily used for heavy knives. The pinch grip is best for rapid and forceful throwing. 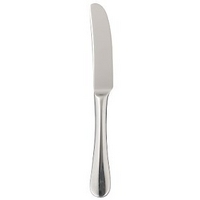 With the pinch grip, the knife is pinched between the thumb and index finger. You should usually only use your thumb or index finger. However, for a heavier knife, you can use your middle finger as well. Knife throwing grip images shown courtesy of KnifeThrowing.info. Few instincts are stronger than a parent’s desire to protect their child from danger, which is why it’s important to teach your children the correct way to use kitchen knives. The most important thing to stress to young ones about kitchen knives is that they are tools, not toys. (1) Make sure you always point knives away from yourself while carrying them. (2) Always use cutting boards that are sturdy and reliable. (3) Make sure you never leave knives unattended. (4) Be conscious of your body language and posture when you are using kitchen knives around young children, as they will learn from example. Be mindful to show caution, for their sake and yours. (5) When you are ready to allow your children to begin using kitchen knives, first start them with a plastic knife and have them cut foods like cheese and butter. Show them how to hold the handle correctly and how to keep their fingers out of the way. Once they progress, you can move them onto a butter knife, and then, once that is mastered, allow them to progress to a kitchen knife. (6) Always supervise children when they are using kitchen knives. Want a few more tips? Check out this cool video from FitforFeast, which has 10 kitchen knife safety tips for kids.